The idea of sugar-fee energy drinks puzzles me. Beverages that are known to have loads of ingredients to help one glean more energy aren’t supposed to good for my health, just help me achieve the intended goal. Plus drinks notoriously lose the integrity of their taste once refined sugar is replaced with whatever substitute is popular at the moment. With those two elements in mind I had a decision to make. 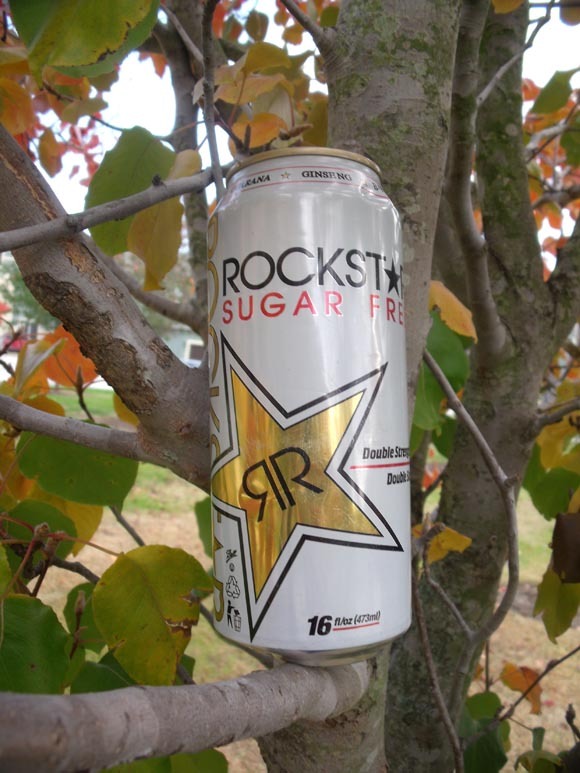 Add Rock Star Energy Drink Sugar Free to my sizable grocery tally, or let an opportunity to review a new beverage go to waste. The choice I made should be obvious. Now with a chilled can in hand I scavenge the stark white and gold label to see how much of a shallow sales pitch I can find. I certainly didn’t have to go far. “Bigger. Better. Faster. Stronger. The world’s most powerful energy drink is now sugar free and contains zero carbs!” Credibility can be a fragile commodity, and that statement eroded what little this drink had. Another admonishment is located in small letters on the back of the can and reads “These statements have not been evaluated by the Food and Drug Administration. This product is not intended to diagnose, treat, cure or prevent any disease.” Why does that statement even need to be on the label? Who would have thought Rockstar Energy drink could cure them of anything? How could a beverage diagnose a disease? Hypothetical If I were sick, would I really need to be told Rockstar Energy Drink is not a viable option for relief? These are questions that may never have an answer. I also wonder what kind of liability the company that produces Rockstar is trying to avoid. Eager to hasten the conclusion of my Rockstar Energy Drink Sugar Free experience I decide to stop reading the label and just drink some. So with pronounced trepidation I crack the top and take the plunge. A bubblegum taste that is a cross between unfortunate and horrid strikes my taste buds with anvil force. An after taste lingers in my mouth and resembles the all too common metallic flavor frequently found in sugar free drinks. I take another sip hoping I was mistaken. I was not mistaken at all; the bubble gum taste hasn’t improved and still tastes like something even carnival workers wouldn’t sell. So with two gulps down I set the oversized can down and decide not to return. Now one more question will go unanswered, why does this stuff even exist? Final review: Do not buy! Folks if you need energy please find something different than Rockstar Sugar Free! Old coffee, flat soda, even warm Zima would be better than this stuff!